Today is Blog Action Day 2010 where thousands of bloggers from 125 countries are writing about water and water issues. Rather than take on the big issue of polluted oceans or that African women are walking over 4o billion hours a year to wells where they collect water for their families, I’ve attempted to focus on the immediate and the practical. Here are ten steps that we can do this week in order to change our consumption pattern. 1. Take showers instead of baths. 2. When you dine out, ask the restaurant manager to consider the practice of putting out water glasses only when requested. 3. Chill your water in the fridge instead of running the tap until it gets cold. And that fuller fridge saves energy too. 4. Know the water footprint of your daily choices. 5. Plant indigenous plants appropriate for the zone in which you live in. 6. If someone doesn’t finish a glass of water at dinner, use it to water houseplants instead of dumping it. 7. Consider secondary uses for water that has boiled pasta and water that clothes were soaking in. 8. Wait until the dishwasher is full or until there is a full load of laundry to run the machines. 9. Compost fruit and vegetable waste instead of using your garbage disposal. 10. Tell your neighbors and your kids why you’re taking these actions. Chances are, they haven’t heard it before and you can help them build a habit. Thanks for sharing these awesome tips, Tammy! Now I’m thirsty too. Thanks Tim. Feel free to repost. With this being the hottest summer of the hottest year on record for the planet, they’ll all catch on. You missed an amazing okra curry. Smart suggestions, and easy, too, as always. Thanks Todd. Just need to turn them into habits. Just heading to your site now! Thanks for letting me know about this. Water is worth savoring . . . and saving. Yes and we don’t think about it often enough. Great tips, Tammy. Being wasteful is a habit worth changing… nobody would argue. Its amazing how many of us don’t think or realize it. Thanks. Thanks for reading Ravi. It is something that we need to be more aware of and we need to make others more aware. Brilliant and so practical, Tammy. I loved it and even in Britain, we run that tap to get it nice and cold. I shall buy a fridge jug tomorrow. Good for you Kate. Although I didn’t list it as a tip, we need some work around the concept of plastic bottled water here at my office. That’s going to be a focus for me. What a great list! I actually already do a lot of these (that comes with living here in Australia, where we’ve been in drought conditions for at least the past five years), but there are some new ideas I’ll try to start implementing. I’ll never forget how horrified I was when I went to America on my exchange year and two of my suitemates would each take two 1-hours showers every day. I couldn’t believe it! Yes, we really have no idea how precious it is. I’ve been reading some of the other water blogs and there are some people with really amazing stories. 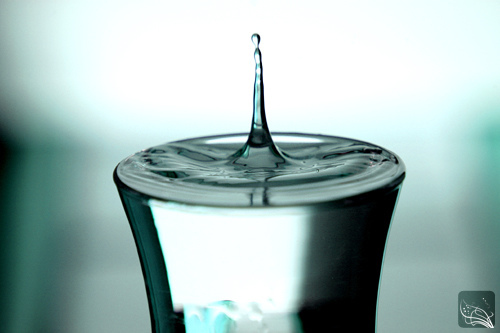 Well done, Tammy – so glad you also honoured Blog Day and posted today about water. My theme is so close to yours that I feel a kindred spirit. We need to change our attitude about water and help others think about usage. May we cause even a tiny shift of consciousness today. Great post! Here at home, we run water from the tap into a pitcher when waiting for the hot water to heat. We use the water for plants, both indoor and out, and to fill the dog’s water dish. Dog’s dish is a great idea. Great post Tammy, I so wanted to also participate as I did last year, but life got in the way of my plans… but I’m so glad I got to read your post though! Fun way to save more water. I feel fairly smug that we do actually do many of the things on your list of 10. I was surprised that flushing the toilet less wasn’t on it! I know it’s a good idea but I have three boys – four if you count my DH. Thanks for highlighting this important issue. I don’t live in the desert, but conserving water is so important, even here in the northeast. Many people’s wells went dry in this summer’s drought. My city gets its water from a local lake, but we’re projected to deplete that supply (start drawing it down faster than it can replenish) in 15 years or so. I would add to the list to not let the water run while brushing your teeth. A lot of water goes down the drain in that 3 or 4 minutes for so many people. Another good and practical tip that definitely adds up. Thanks. The major issue is raising awareness – that’s where we need to start. Hmm, I have a lovely bath tub and I think I’ve been in it once. Not my indulgence but I won’t go without flushing the toilet. Great tips. I had not heard of Blog Action Day but I like the idea. We live in a city where we do not get piped water every day; instead, we have a tank on the roof that fills once a week from the city’s source, and if we use all that water before refill day, we are pretty much out of luck. This has really made me conscious of my water usage, even when we are back in America. I think that experience will serve you well. I wish we’d all had something like that to make us more aware. rain barrels can really help, too. You’re the second person to talk about rainwater conservation. It’s something that I don’t know about and although we don’t get a lot of rain, during certain times there is an opportunity to conserve. I think your number 2 is kinda cute.. 😀 And thanks for the tips and your ‘action’! Thanks for your visit to my site, I am glad that way I found yours!! Hope to keep the conversation going with you and with water! Thanks for visiting Rachana. I agree that this is a very important issue – if not THE most important issue. Look forward to getting to know you. Thanks for the updated tips, Tammy! It seems that several people agree with you Sophie. Wonderful post. My mother grew up during the depression, so she and her late siblings have always been conservative with everything. One time when my sister and I were hanging out with some cousins, one of our cousins remarked that she was embarrassed by all of the things their mother did to conserve water. I pointed out to her that if we all did that, the world would be in much better shape now. Yes, it’s really interesting to read some of the water posts from places where they get their water once per week. I like the idea of Blog Action Day. It was useful from a writing perspective but also very intriguing to have the world speaking on one topic. Love that rainwater idea. I’m also going to explore that. Thank You for Your all tips concerning the use of water. In my family we are very aware about this problem, because although in my country we have plenty of water, but water is very expensive. Number of our lakes is 90000 lakes which sizes are 2.5 acres and 56000 lakes which sizes are more than 2.5 acres. We have many of Your tips in use, but in addition of this, I am making every month a statistics in Excel worksheet and comparing monthly use and yearly use of water. Doing this way, we can think what more we can do. Great that you are keeping track of it. I like to do that also. Great tips and great post. I’ve been mostly cognizant of not wasting water because my father was really on us about wasting a resource that so many don’t have access to but my guilty secret is that I always flush toilets before and after I use them. I think there may be a lot of misconceptions when it comes to common knowledge about water issues. Last week I had a conversation with someone who couldn’t understand how water would be an issue because it is a resource that easily and naturally replenishes and renews itself unlike oil. I had less than 3 minutes to be somewhere else so I couldn’t quite finish that conversation. Fodder for another post maybe?